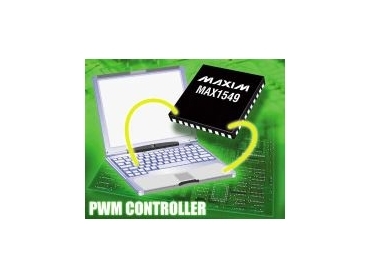 MAXIM Integrated Products, represented by Arrow Electronics , has released the MAX1549, a dual, pulse-width modulation (PWM), step-down controller. It provides the high efficiency, excellent transient response and high dc output accuracy necessary for generating low-voltage chipset and RAM power supplies in notebook computers. Single-stage buck conversion allows the device to directly step down high-voltage batteries for the highest possible efficiency. Low-output voltage applications require two-stage conversion-stepping down from another system supply rail instead of the battery. The controller employs a fixed-frequency, current-mode PWM architecture that does not require complex compensation. The MAX1549 also interleaves the dual step-down regulators, minimizing the input capacitor requirements. The Quick-PWM controllers are free running and have constant on-time with input feed-forward. This configuration provides ultra-fast transient response, wide input-output differential range, low supply current and tight load-regulation characteristics. The controllers accurately sense the inductor current across an external current-sense resistor in series with the output to ensure reliable overload and inductor-saturation protection. Alternatively, the controllers can use the synchronous rectifier itself or lossless inductor current-sensing methods to provide overload protection with lower power dissipation. The MAX1549 is available in a 40-pin TQFN package with optional inductor-saturation protection, and overvoltage/undervoltage protection. It is screened for the extended temperature range of -40°C to +85°C.